Nick and I love books. We both read a lot, but we don't like borrowing books from other people or the library, nor do we have a Kindle/Nook/etc. We both really enjoy holding a book in our hands and putting it on our bookshelves once we're finished reading it. This year especially, our book collection has grown a lot (hello, cheap Goodwill books!) and we're starting to run out of room on our shelves. We have two fireplaces in our apartment, so we have a lot of mantle space that is perfect for displaying books. Like I mentioned in our Skull String Art post, we have a bit of a thing for skulls right now, so when I saw DIY skull bookends on The Band Wife blog, I thought, "I MUST HAVE THESE NOW." 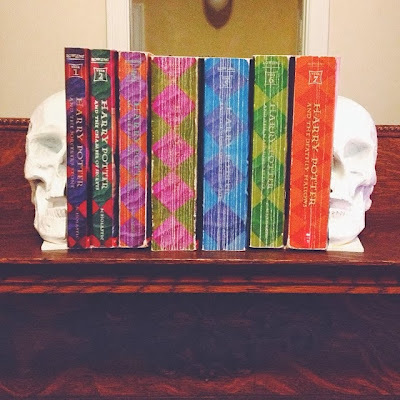 I was super pumped to make these awesome bookends and clear up some space on our bookshelves. Definitely a win-win. 1) Cut your skull in half down the middle. 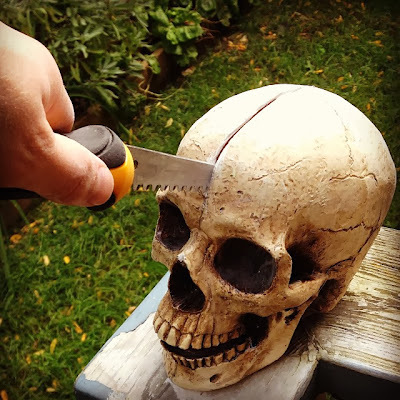 We suggest marking the middle of the skull with a pencil before you start cutting. Nick cut our skull with a jab saw, but he recommends using a hack saw or something with finer teeth. Also, this process makes a lot of dust so you should probably do it outside. 2) Cut your piece of wood to the size you choose. We cut two 4"x6" pieces. 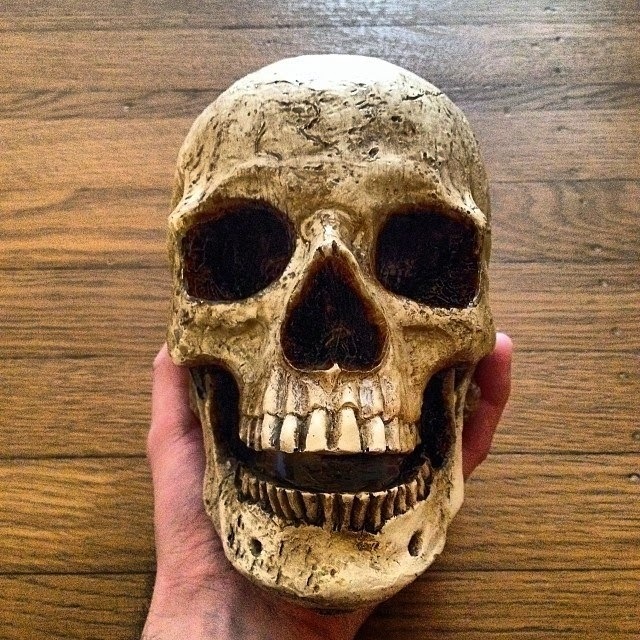 3) Spray paint your wood and your skull. It may be easier to glue your skull pieces to the boards first, but I sprayed ours separately. Both the boards and the skull required a few coats of paint to cover completely. Make sure you get into all of the nooks and crannies of the skull for even paint coverage. 4) After your paint is completely dry, use wood glue to glue the skull halves to your wood bases. Use heavy objects to hold the skulls in place until they dry. Once your glue is completely dry and your skull halves are secure, you're ready to display them! We used ours to display the Harry Potter series on our living room mantle. I think they look pretty great. Even though skulls can convey a Halloween theme, our bookends definitely will be on our mantle year-round. This project has really inspired us to think of other creative bookends we can make. What would you use for your bookends? Share with us in the comments!